I've always hated those braggarts who shout about every adventure, every trip. But today, I am one. Today I leave for a week of cooking classes in Italy and a few bonus days in Rome. Me. I'm leaving. Getting on a jet plane. Holy cow. Not that we've had our requisite work meeting where I tell my more-capable-than-me staff how to work everything while I'm gone (I'm sure they'll do a better job than I usually do! ), I'm finally excited. And nervous. And just a wee bit nauseous. Some folks would consider me adventurous or brave, but really, I'm chicken-hearted to the bone. Sure, I moved to NYC immediately after college graduation not knowing a soul, not even my roommate, and making a measly $17k a year (it was a fun, but not prosperous time). Sure, I started my own business, and still have it going strong almost 8 years later, when folks in town actually laughed at me. Out loud. But I've never been a world traveler. 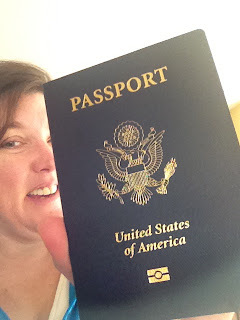 Indeed, I just snagged my very first passport (here's a hint: go the the Middletown post office -- they're awesome there). So when my friend and co-worker Sharon sent me a Groupon deal for a week of cooking classes in Italy, even I couldn't believe that I jumped on the deal. It didn't feel real, like it would actually happen. Then we booked the flights. Then we added on a few days for Rome because really, will I ever get back? My husband John not only agreed to this grand Italian scheme, but encouraged me as well. The kids? They're both teens now, and pretty self-sufficient in the mornings. I know they'll be fine, as will the puggle, nuzzled under the blankets on my bed as a write. But as I do the last minute laundry, and throw various and sundry items into plastic bags, and whip up a meal or two for when I'm gone, I wonder what I hope to get out of this trip. Am I hoping for a fun trip with friends (my friend and other co-worker, Kerry, is also coming along) with food and wine? I am looking for real instruction form real Italians? Am I looking for time away from the family? A chance to see a place in person that I've only ever seen in movies and photos? To find my own thoughts in the mountains of Italy without the constant banging in my head of world and family and life? Maybe I'm looking for all of the above. No one in my family is a world traveler. We kept things close to home when I was growing up, making the same trip to the same family cabin in the middle of no where (with no bathroom) for the same vacation...when we took one. An adventure was taking the highway to Gettysburg, just 30 minutes away, and driving through the battlefields, almost never being allowed to get out of the car to climb the rocks at Devil's Den or the monument at Little Roundtop, but instead listening to my dad wax on about his time there as a kid and all the fun he had. When I met my husband, and he had a passport, I was amazed. He'd already been to London and was planning a trip to France with a friend. This just wasn't common in my circle and it seemed so...sophisticated. I wouldn't need a passport and where every other person on the beach was from New York City too), and I'm taking it without the family. It feels weird. I know that as much as I'd like to take more trips to more countries with more family members, this could be once in a lifetime. I'm a realist, and with two kids headed to college, one in just over a year, and a teacher's salary and a small business owner's salary, this could be it. For a long time, or even forever. But I sure hope not. If I take a few good pics, I'll post them here, or maybe on my person or Kitchen Studio Face book pages if you're interested, and I'll do my best not to be cheesy, but no guarantees. If you've been to Rome, or Carunchio, please let me know. I'd love to know where to go, what to see. When I'm not cooking of course. That said...ciao!